Also serving communities of Lebanon. There are 4 Memory Care Facilities in the Albany area, with 3 in Albany and 1 nearby. The average cost of memory care in Albany is $3,922 per month. This is lower than the national median of $4,650. Cheaper nearby regions include Woodburn with an average starting cost of $3,450. To help you with your search, browse the 17 reviews below for memory care facilities in Albany. On average, consumers rate memory care in Albany 4.5 out of 5 stars. In 2018, about 65,000 Oregonians over the age of 65 were living with Alzheimer’s disease, and this number is expected to increase to 84,000 by 2025. In Albany, more than 15 percent of the city's over 50,000 residents are in this age group. For those seniors who have been diagnosed with dementia and need specialized care, Albany offers at least three different memory care facilities. Oregon licenses memory care facilities in Albany and throughout the state as nursing facilities, Assisted Living Facilities (ALFs) or Residential Care Facilities (RCFs). In addition to meeting basic requirements, any facility that offers memory care services in Oregon has to follow several special state rules. Memory care facilities may offer secure outdoor spaces where seniors can enjoy Albany's climate, which is significantly more comfortable than that of the average U.S. city. Summer temperatures in Albany are usually in the low 80s, while winter temperatures are typically in the mid-30s, with an annual average of only 4 inches of snowfall. The Albany area is home to world-class medical facilities, including those specializing in brain health and dementia care such as The Corvallis Clinic and Samaritan Neuropsychology, in the event of medical emergencies or illness. 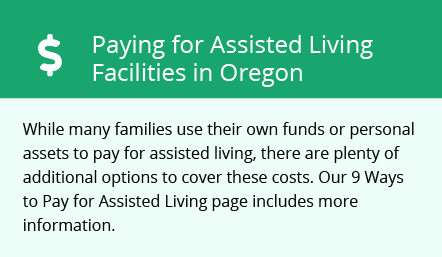 Living costs in Albany are below the Oregon state average, making it a more affordable place for seniors with dementia to obtain memory care services than nearby communities such as Corvallis and Philomath. For comparison, it costs 24 percent more, on average, to live in Oregon state than the U.S. national average, but only about 6 percent more to live in Albany. Safety is a significant concern for seniors and their families when considering a memory care facility's location. According to Neighborhood Scout, Albany has a combined violent and property crime rate of 28 crimes per 1,000 residents, which is about the same as the U.S. national average. Memory Care costs in Albany start around $3,922 per month on average, while the nationwide average cost of memory care is $4,799 per month. To see a list of free memory care resources in Albany, please visit our Assisted Living in Oregon page. Albany-area assisted living communities must adhere to the comprehensive set of state laws and regulations that all assisted living communities in Oregon are required to follow. Visit our Memory Care in Oregon page for more information about these laws.